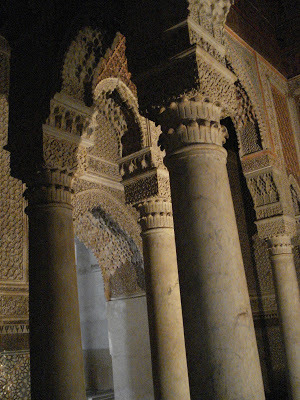 This month I’ll be writing about stunning architecture, and I’ll begin with the Saadian Tombs in Marrakech, Morocco. Built in the time of Sultan Ahmad al-Mansur in the late sixteenth century, it’s one of the few structures from his reign not to have been destroyed. A later sultan, Moulay Ismail, looted almost all of the buildings erected in al-Mansur’s dynasty. However, he was reluctant to destroy the mausoleum because he was superstitious about grave robbery. Instead, he sealed off the complex, and it remained that way for several hundred years. It wasn’t until 1917 that an aerial map alerted a general to the tombs. They were unsealed and restored to their original beauty. And that’s a high standard, considering the mausoleums were built with imported Italian Carrara marble, and the archways were lined with pure gold. Central Mausoleum holds the spectacular Hall of the Twelve Columns, where the sultan himself and his closest family members were buried. In all, sixty members of the Saadi dynasty were buried in two main mausoleums, while another hundred were buried in the adjacent courtyard. I'm so glad the tombs were kept in their original state…it would have been a tragedy to ruin such beauty. Those tiles, the patterns, the arched doorways- Gorgeous. 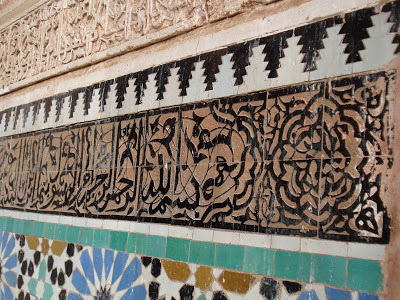 Beautiful tiles- I just love the soft colors and the light in your pictures;-) I would love to see this in person! I wonder how long it too to create the tombs. And how many workers were involved. Morocco is always so magical looking. Like something out of a dream. This is stunning and gorgeous!! LOVE it!! Beth this is absolutely beautiful! Wow, I love the richness of the architecture. Love the details on the tombs. It's amazing to think of how they did it back then. I love when you share pictures. Beautiful, Beth. I regret I've never been there and really appreciate your photos. 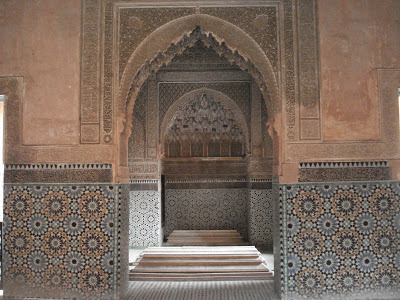 I'm so upset at myself for missing the Saadian tombs in Marrakech! 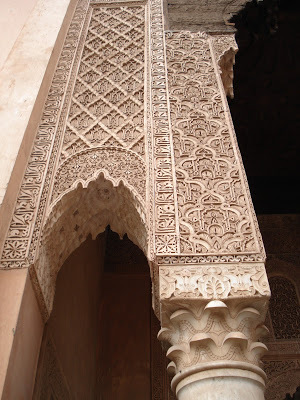 It's beautiful, and it sort of reminds me of the Alhambra Palace in Granada, with all the intricate lattice work pillars and arches / friezes, and the mocarabes ceiling 🙂 Just amazing detailing!